We are one of three combined prefectural junior and senior high schools in Kumamoto prefecture. 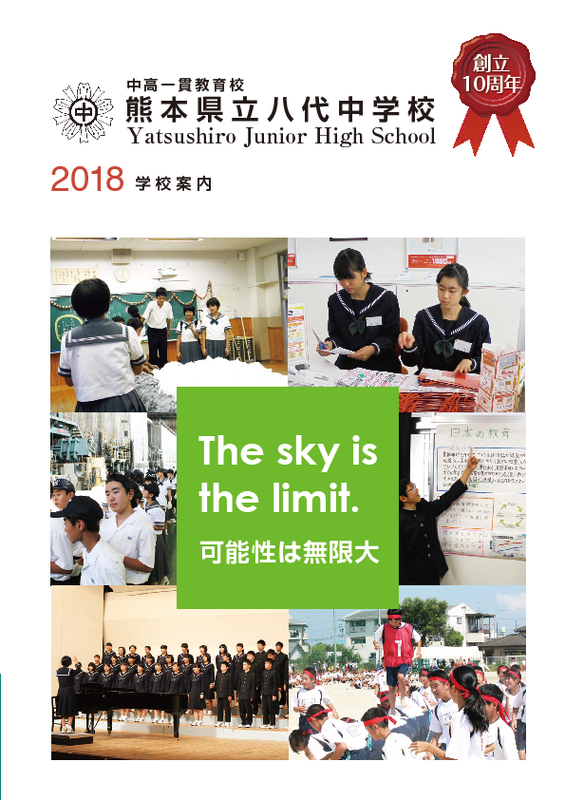 In 2012, the first class of Yatsushiro junior high students graduated and entered Yatsushiro high school. Working hard with each other, all students are able to enjoy their school lives. Through having school life and club activities operate with a wide range of age groups, students can enhance their sociability and rich sense of humanity. When you enter our school, you will be a role model for junior high students. You will be together during school events and club activities. Therefore you will soon realize that you are an older student and feel a sense of responsibility. You will also develop your leadership abilities. Thanks to sharing school life with lively and active junior high students, the overall atmosphere of our school is more bright and energetic. You will feel drawn to become more active in our school. The responsibilities and vitality which students cultivate here enrich all the aspects of their daily life. They work actively not only on school events and club activities, but also on studying. Through this system high school students counsel junior high students on issues regarding their school lives. High school students also get good experience through this program. Several clubs welcome junior high students. Of course it is difficult for them to do exactly the same things as high school students. High school students however coach them willingly. The following clubs welcome junior high students: biological research, physics research, scientific research, astronomy, track and field, brass band, kendo, judo, chorus, and art. We have almost all school events include junior high students as much as we can. Some examples are the athletic meet, school festival, lectures, and assemblies.